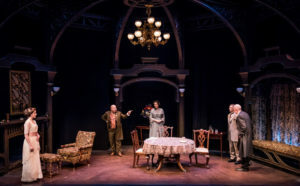 In today’s Wall Street Journal drama column I report on an extremely rare revival by the Mint Theater Company of Stanley Houghton’s Hindle Wakes. Here’s an excerpt. Of all the countless off-Broadway troupes with which the side streets of Manhattan are dotted, none has a more distinctive mission—or a higher artistic batting average—than the Mint Theater Company, which “finds and produces worthwhile plays from the past that have been lost or forgotten.” If that sounds dull to you, don’t be fooled: I’ve never seen a production there that was a sliver less than superb. Rachel Crothers’ “Susan and God,” John Galsworthy’s “The Skin Game,” Harley Granville-Barker’s “The Madras House,” N.C. Hunter’s “A Day by the Sea,” Dawn Powell’s “Walking Down Broadway,” Jules Romain’s “Doctor Knock,” John Van Druten’s “London Wall”: All these fine plays and others just as good have been exhumed by the Mint to memorable effect in the 13 years that I’ve been reviewing the company, a tribute to the uncanny taste and unfailing resourcefulness of Jonathan Bank, the artistic director. Fanny Hawthorn (Rebecca Noelle Brinkley), the sparky Lancashire lass at the center of “Hindle Wakes,” lives with her working-class parents (Ken Marks and Sandra Shipley) and toils alongside Christopher, her father, in Hindle’s cotton mill. She’s returned home much later than expected from what the Brits used to call a “dirty weekend” with Alan Jeffcote (Jeremy Beck), a hard-drinking young man about town. No sooner do the Hawthorns confront Fanny, demanding that she tell them where she went and what she did there, than Christopher pays an unscheduled call on Alan’s father Nathaniel (Jonathan Hogan), the owner of the mill and the richest man in town. The objective, naturally, is to force Alan to make an honest woman out of Fanny, but that’s where the plot starts to thicken. Nathaniel, it seems, is a childhood friend of Christopher who clawed his way up the greasy pole of success. What’s more, he’s about to marry off his ne’er-do-well son to Beatrice (Emma Geer), the mayor’s daughter, thereby securing for himself and his wife (Jill Tanner) a place in society that the money of a self-made businessman who “started life in a weaving shed” can’t buy. In today’s Wall Street Journal “Sightings” columns I pay tribute to one of the most interesting magazines of the Thirties. Here’s an excerpt. 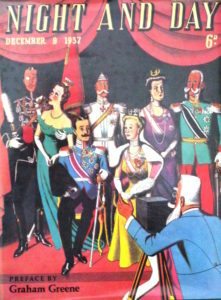 Of all the American general-interest magazines that came and (mostly) went in the 20th century, surely the most enduringly significant is the New Yorker, launched by Harold Ross in 1925 and published to this day in a format that would be easily recognizable to its charter subscribers. Only Reader’s Digest and Time have had longer runs, and both are now well past the peak of their once-formidable influence. Not so the New Yorker, which is as central to the cultural conversation today as it was when Ross and William Shawn, his successor, called its editorial tune. The New Yorker has been around so long that it is surprising how few imitators it has spawned. Moreover, none of them were commercially successful, and only one is still known, if only to literary connoisseurs: Night and Day, a weekly that sought to transplant the sophisticated style and design of the New Yorker to England between the wars. While it was published for only a short time, putting out its inaugural issue in July of 1937 and shutting down six months later, Night and Day made a impression that has yet to fade. It pops up, for instance, in “Dancing to the Music of Time,” Hilary Spurling’s new biography of the novelist Anthony Powell, a regular contributor to Night and Day, who had previously recalled its “undoubted freshness and style” in “To Keep the Ball Rolling,” his 1983 memoir. Two years after that, Christopher Hawtree published a lively coffee-table anthology called “Night and Day” whose star-studded index shows why the magazine is so well remembered. (The book is out of print, but used copies are fairly easy to find.) In addition to Powell, the regular contributors included, among others, Evelyn Waugh, who reviewed books; Graham Greene, the co-editor, who doubled as film critic; and John Betjeman, Elizabeth Bowen, Alistair Cooke, Christopher Isherwood, Constant Lambert, Malcolm Muggeridge and Herbert Read. All were mainly out to amuse, though Night and Day was not above publishing more serious fare. For the most part, however, it was, like the New Yorker in the ’20s and ’30s, a chiefly comic magazine. Therein lay its appeal: At a time when England was looking nervously at the totalitarian monsters who were swallowing up Europe, Night and Day gave its subscribers something to smile about….